Do you know a quality splitting maul can work faster than an axe, even on tough wood? Of course, it does, if it is a branded quality splitting maul. Not only does a quality maul split faster but also works with a large amount of woods easily. 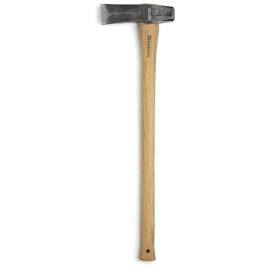 In this consideration, I would recommend you Husqvarna 32” wooden splitting maul. Why should you choose Husqvarna 32” wooden splitting maul? Here are the important factors that compelled me to recommend you to consider this branded quality tool. What does Husqvarna offer with? It is known to all that the higher quality steel, the higher quality splitting maul is, meaning that the quality of a splitting maul depends on the steel it is made from. The Husqvarna 32” wooden splitting maul is made from Swedish hand forged carbon steel which is well known around the world for its continual quality. Any splitting maul or axe having the head made of forged steel has a durable edge that can cut through even the hardwoods easily and stay sharp longer. The most common problem woodworking people face when splitting woods with the maul is broken handle. To avoid such happening, Husqvarna provides a durable handle made of solid hickory that can compete with maximum force applied and stand against the hardwood. The handle is shaped perfectly with traditional style, providing a smooth surface to ensure maximum comfort while splitting. What makes this splitting maul special to part medium to large logs is its 32’’ long handle which is easy to slide up and down in your convenience. The handle is designed ergonomically with the perfect diameter so that you can grip the handle firmly with maximum control and safety. The maul features dual head, the flat head for chunks of wood and the axe head for driving wedge, to get different jobs done with the same tool. Now you do not need to change your tool to drive the wedge if you cannot split hardwood. The edge of the head is sharp enough and has a hardened surface to cut through the old difficult logs effortlessly. Loosening the head from the handle with the force created when splitting is common happening; even your tool is made of good quality steel along with hardwood hickory handle. If you do not notice loosening the handle while working, it may cause an accident in your unbeknownst. As Husqvarna uses both wooden and steel wedge to join the head with the handle to make sure that you are safe enough with every swing. A quality maul should have perfect balance in the weight between the head and the handle to get the highest splitting efficiency. Since balance affects the swing accuracy and aim, Husqvarna provides both the head and the handle with an ideal balance that results in much more and accurate cut in every swing with less force. It weighs overall 6.8 pounds while the head is only 6 pounds that means the head is powerful enough to cut through even knotty woods but easy to swing at the same time. Maybe you are thinking about how you can care and protect your favorite tool. Are not you? Nothing to get worried since the leather sheath Husqvarna comes with is enough to cover the edge of the blade in order to avoid any damage. Moreover, if you lose the cover, you can buy one from the market. Yes, it comes with an unfinished handle what you feel unsmooth for when handling. But applying linseed oil on the handle gives you more smooth hand feel than a finished handle does. It is needless to say that Husqvarna provides the best quality mauls that can last long, even for years except for any unexpected incident. With little care and awareness such as storing it in a warm condition, greasing it to avoid rust and so on, you can handle it to your next generation. Now that you know all why should look for Husqvarna 32’’ inch wooden splitting maul for the money? I think it should be your dream arsenal for splitting thanks to its super quality. The hand forged steel head and the hickory handle of this maul should be a unique choice for anyone who requires splitting a large amount of woods.